Pench National Park is named after the Pench River that flows through the region from north tiger safari to south through the National park. 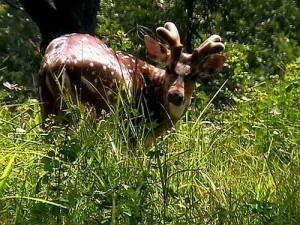 Located in the southern boundary the Park is at the foot of Satpura hills in Madhya Pradesh. The National Park is a Conserved area to the 19th century Project Tiger Reserve under the umbrella of Project Tiger. The Park is covering an area of 758 square kms with the moist deciduous forest of southern Indian tropical and the tropical dry deciduous teak trees. The region has a number of small streams and nallas that are only temporary formed during the rainy seasons. The River is known to get dried up by summer of April, but a number of pot holes or dohs as known locally are usually the main source of water for the wild animals. But since the distribution of these sources is not quiet even through the National Park, so much of the area is not utilized by the animals. The main source of the water during the pinch period is usually the Pench Reservoir. 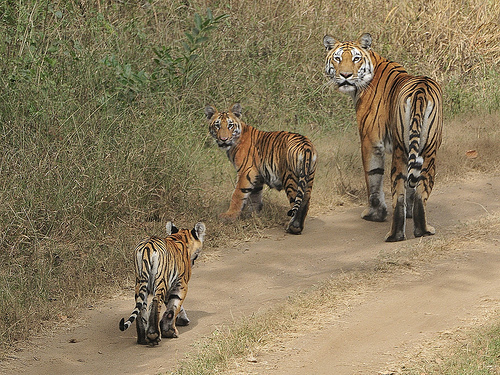 Tigers usually inhabit the region along the Pench River as this is the area where most of the wildlife is concentrated. Leopards may also be seen in this deep area forest although they may not be very common inhabitants of this area. Small Indian Civets, Leopard Cats and Palm Civets are the most common inhabitants of this region but they can be rarely seen in the open. 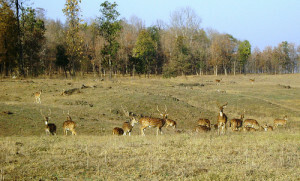 Cheetal, Nilgai and Sambar are common grazers of this region in the open grassland and along the road side or even the banks of river and its reservoir. Jackals can be seen moving about the region in search of prey. Packs of around 15 wild dogs can also be seen in the area of Jamtara, Pyorthadi, Chhedia and Bodanala. Bamboo patches and the stream is a common inhabitant for the spotted Gaur. Sloth bear are also found in the rocky regions and the infested forest. Chinkara is found in this region in Telia and Dudhgoan villages. Langur Monkeys are most commonly seen in this region and if lucky Rhesus monkeys can also be spotted. The region has more than 210 species of birds in forest with many species of migratory birds. Red jungle fowl, Magpie robin, Redvented bulbul, Crimson breasted barbet, Peafowl and Crow pheasant are some of the most common species found in this region. Situated in the Seoni District of Madhya Pradesh the park runs in continuation with National Park in Maharashtra. The Park is situated at a distance of 82 kms or 2 hours drive and is well linked to a number of important places in Madhya Pradesh and Maharashtra via road. Jablapur is the nearest railhead around 192 kms from the Park. It serves as an important air and rail route. The forest is blessed with southern tropical dry deciduous teak and mixed deciduous forest in all the directions. A number of other species are found in this forest including trees, climbers and shrubs. Certain other species including the moyan, mocha, tendu, achar, ghont, bija, skiras, mahua, amaltas, khair, palas, kihamali are also found in this region, but may simply be restricted to certain valley. The forest is very rich in fauna as a number of endangered species are found here. The forest is a preservation for nearly 25 tigers, 13 species of reptiles, 39 species of mammals, 3 different species of amphibians, and more than 170 different species of birds. The Park is very much rich in Bird species that can be found here. Over 210 different species of barbets, minivets, bulbul, mynas, waterfowls and kingfishers can be found here.